MICO makes Arduino cell phone interface easy, so that users can focus on creating their awesome projects and not on debugging. MICO is the development platform for creating remotely controlled projects such as Home automation taking advantage of the cellular network. 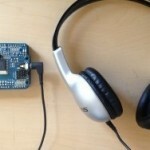 MICO plugs into an Arduino board and connects to a cell phone’s headset jack. MICO answers the cell phone attached to it and then uses pre-recorded voice prompts to present information and options to callers, and touch-tone telephone keypad entry to gather responses. Responses can then be used to control lights, motors and other actuators, and get readings of sensors such as temperature, proximity and others. Of course since it relies on the cellular network, the caller can be just a few feet or hundreds of miles away from where the project is physically located! 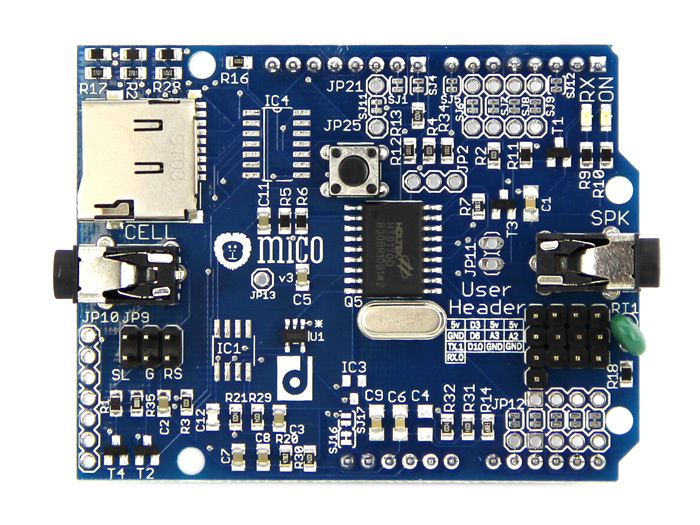 MICO board is now available for sale for the general public! Click here to get yours! The MICO software is free, open source. These libraries and sample sketches are compatible with the Arduino Software and will help you get you going in no time! Visit the getting started section for specific instructions and tutorials on using your board. The forum is the place to start with all questions. There you’ll find the Q&A with common questions. For information on the development of MICO, see the Gadget Makers’ Blog . Changes to the software are discussed on the Github project page. Mico is the Portuguese/Spanish word for small monkey. It’s pronounced “mee co”. These very smart little creatures inspired the name for this cool open source code shield. 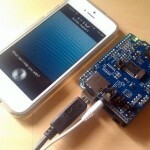 MICO stands for Mobile IVR & Control and is a shield for Arduino. 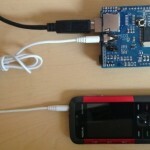 Below is a list of other projects out there that discuss interfacing Arduino to a cell phone. Those projects were not verified, and are just listed as a reference.